As a part of the NIU Art Museum’s upcoming Southeast Asian Exhibition Suite, “Music for the Divine” showcases Burmese traditions and musical instruments ranging from those used in Buddhist rituals, traditional royal court ceremonies and contemporary multi-ethnic expressions. This exhibition will run in the South Galleries, and will feature the Burma Art Collection at NIU from Tuesday, Aug. 28, to Saturday, Nov. 17, with a public reception from 4:30 to 6 p.m. Thursday, Sept. 13. “Music for the Divine,” curated by Catherine Raymond, director of the Center for Burma Studies and professor of art history at NIU, showcases a unique collection of Burmese musical instruments from the Burma Art Collection at NIU. Each of the instruments on display (harp, bronze drum, flute, hsain waing (gamelan ensemble), patala (xylophone), conch, bells, chimes, etc.) is a work of art. Created by artisans from within the various Burmese ethnic groups, their forms and sounds are expressions, not only of aesthetics and technical skills, but also of religious ideals, community identities and political relations. 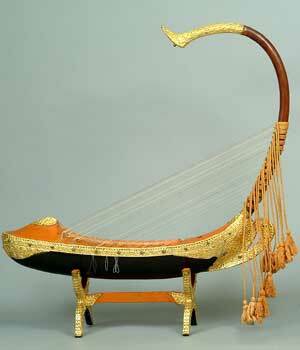 For example, the harp – the quintessential instrument of the dominant Burman culture – historically had specific Buddhist and courtly functions, as does the patala. 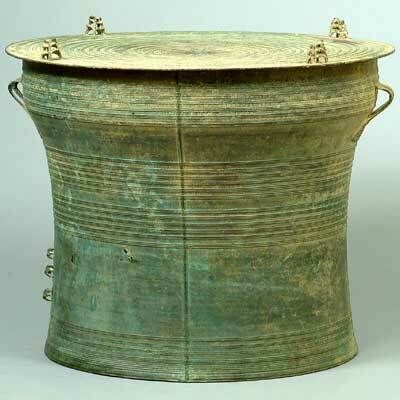 The ozi (a long cylindrical drum) is used by the Shan to accompany popular dance; while the iconic bronze drums of the Karen could traditionally have served in animistic ceremonies, including those calling for rain. As part of an on-going commitment to share this unique collection with the Northern Illinois community, “Music for the Divine” is thematically linked with programming spanning several colleges and departments at NIU, including the School of Art, the School of Music, the Department of Anthropology, the Department of History and the Center for Southeast Asia Studies. “Music for the Divine” is also a component of the “Celebrating Creativity: Asian/Asian-American Identities Project,” offered in conjunction with the Cambodia Studies Conference, planned from Thursday, Sept. 13, through Sunday, Sept. 16, at NIU, and the International Burma Studies Conference, scheduled from Friday, Oct. 5, through Sunday, Oct. 7, at NIU. Located on the west-end first floor of Altgeld Hall, the galleries are open to the public from 10 a.m. to 5 p.m. Tuesday through Friday, noon to 4 p.m. Saturday and by appointment for group tours. Exhibitions and lectures are free; donations are appreciated. Pay parking is available in the visitor’s lot on Carroll Avenue and at metered spots in front of Altgeld Hall. Free parking is available Saturdays and during receptions and visiting artist lectures in the lot northeast of Gilbert and College Drives. The exhibition is sponsored in part by the Illinois Arts Council, a state agency; the Friends of the NIU Art Museum; and the Dean’s Circle of the College of Visual and Performing Arts, NIU Foundation. Call (815) 753-1936 for more information.